We’ve been using the DexCom CGM for a few months. The adhesive seems to stick well, but as we push each sensor to its limit the issue sometimes becomes the adhesive, not the sensor itself. 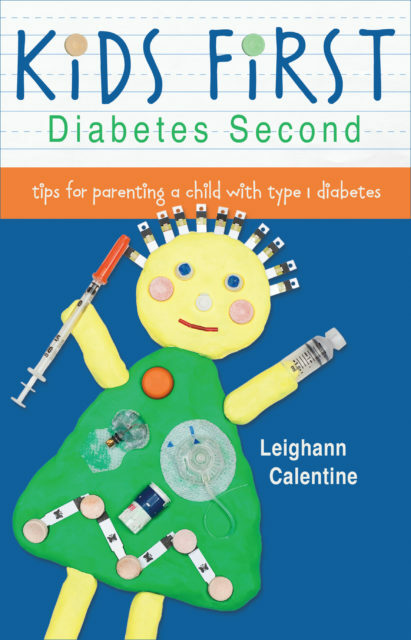 I have heard several people with diabetes (PWD’s) and parents say they use Opsite FlexiFix. 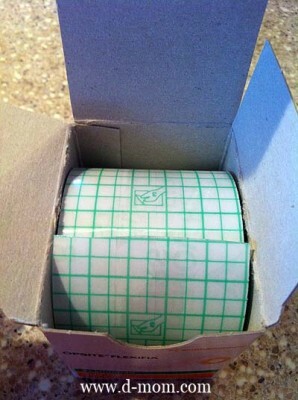 It comes in a roll and you can cut the length you need. You can also cut out a hole for the sensor. Prices of this adhesive vary greatly. Amazon was NOT the best price I found. Some sites were much cheaper, but shipping was expensive. In the end I decided to order from American Diabetes Supply. 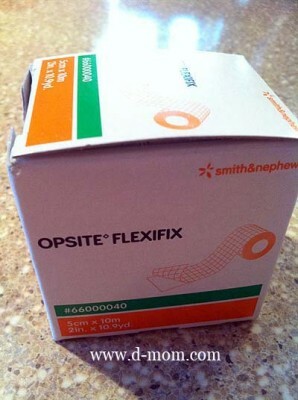 So, back to Opsite Flexifix. The first couple of times I used it I had a tangled mess and stuck my fingers together. A few people gave me tips and using those, plus my own experience, I now have a system that works pretty well. 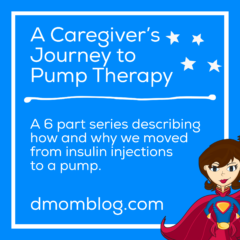 Because everything diabetes has to be complicated, right?! 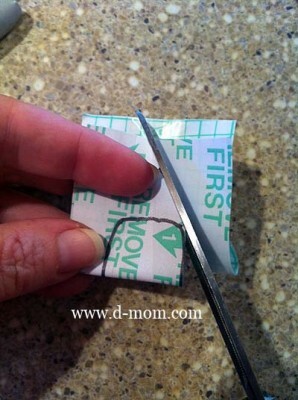 I eyeball and cut a piece that will extend past the DexCom adhesive. I use an old sensor to trace a hole for the middle. I was perplexed by how to cut out that center hole without breaking out the craft knife. I had the idea to fold it over and cut it out. Works much easier for me. Here’s where I used to get tangled. The first few times I took off both halves of the adhesive that said to remove first. Now I just take off the one strip of it so I can get it in place. 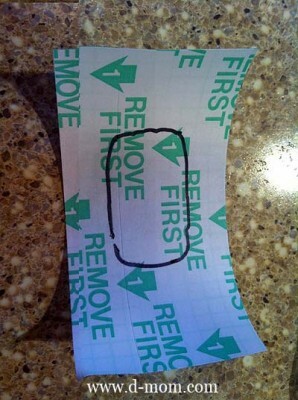 Then I remove the second half of the white “remove first” backing and smooth it down. 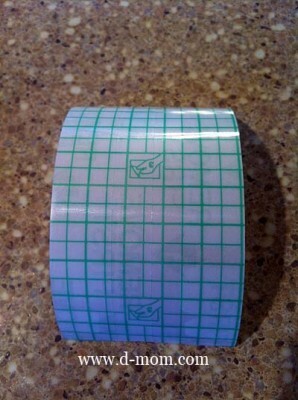 Lastly I peel off the green grid layer. Et voila! When we were using the Medtronic CGM we would cover the entire thing with Tegaderm because you had to keep the clam shell shaped transmitter in place. 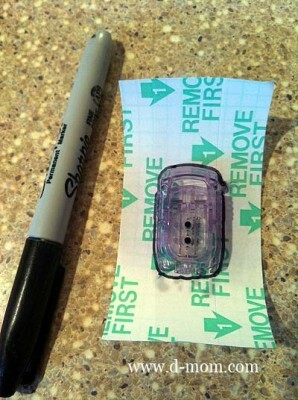 With the DexCom you don’t have to use a layer of adhesive until well into it’s life cycle. This isn’t medical advice (none of this ever is!) 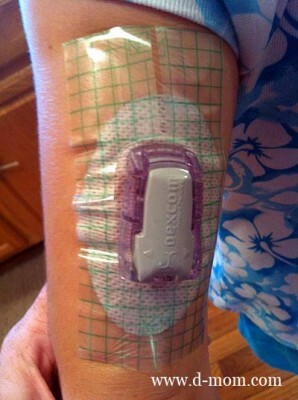 but some people wear a DexCom sensor two or three times as long as it is FDA approved for. 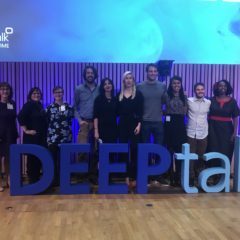 And something I learned at Friends For Life in the session with the rep from the FDA is that a device is medically approved for a certain length of time based on the study that the company submitted. The DexCom isn’t approved for kids only because they didn’t do a pediatric study and submit it to the FDA. They are currently doing a pediatric study on the next gen DexCom G4 Platinum system. Yay! The DexCom sensor is approved for 7 days and the Medtronic sensor is approved for 3 days because that’s what they submitted to the FDA. The sensors in theory could work longer, but they aren’t technically approved for longer. And I’m not telling what day we were on when I slapped that Opsite Flexifix on Q! Six Until Me: Opsite Flexifix: You Can Stick Around. *Disclosure: Ebates has a refer-a-friend program, but I just really love using them when I shop online. Cool ideas, like the ebates tidbit. We use something similar with the medtronic sensors. We may, however, switch Audi back to dex when the 7 is available to us. Take care. Ella’s G4 arrived today, watching the tutorial as we speak! The G4 picked up almost her readings throughout the night atleast 40 feet away and down the hallway! I didn’t sleep much last night as I stared at it every hour but I think this could be an amazing tool for nighttime! So great to hear!! I will be so happy if we can ditch the baby monitor. Keep us posted on how it’s going. I love it! An elegant solution–that custom-cut opening. I’m getting some op-site! Thanks for info on this, I have ordered the tape. Do you find it to be different than IV 3000, have been trying that with skintac and it doesn’t stay more than a day after my girl’s swim practice! I suspect that if I just kept reapplying the extra layer of tape daily, that the tape will come off, but it’s like the necessary sacrifice to keep the Dexcom layer intact. One other thing that we do, which might help, is that we never put it on if she’s going to be taking a shower or swimming within a couple of hours. 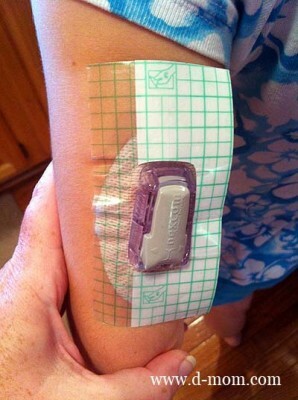 It almost seems like the adhesive needs a little bit of time to cure and really get secure (same goes for the OmniPod). 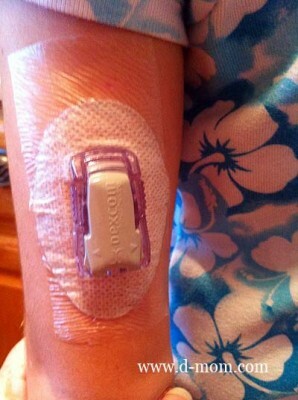 Also, DexCom will replace any sensor that doesn’t make it the full 7 days. We call in any that don’t last that long. I am wondering how you extend the life of it when the sensor shuts down automatically when the 7 days are up. I have worn Dexcom since they came out and have not figured out anyway to extend the life. I would be afraid the readings would be off if it goes past 7 days. 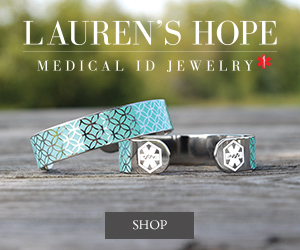 I came across your site while searching for a solution to my daughter’s skin irritation from the Dexcom adhesive, but I also have the same question as Lori. How can you keep the sensor working for more than 7 days? Thanks! 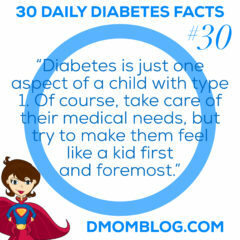 Being diagnosed with diabetes is hard. Fitting in is already hard enough. So having to wear an awkward and ugly pump or device that may fall off during activities is not fun. 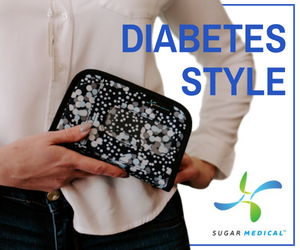 Managing Diabetes now is easier with new technology like Dexcom continuous blood glucose monitors (CGM) and Omnipod insulin pumps, which make being a diabetic more manageable. But having all these devices falling off before they should or getting in the way while being active, is a downfall of these devices and I have found a way to fix that. First time I used my Dexcom I did not like how it felt after just a couple days it worked its way loose a little and i could feel the sensor poking me and it was uncomfortable. Living in Florida and being active at the beach and around water is my life. 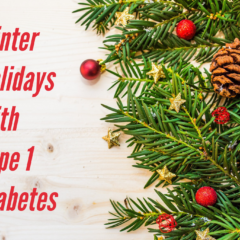 These activities and lifestyle did not work well with my diabetes and many common activities made my CGM fall off early or get loose and unconformable. I started cutting out bandages and tape to put over my sensors but they were ugly and did not last. I decided to design patches to help these devices and pumps fit into your lifestyle and make a design for your personal style.